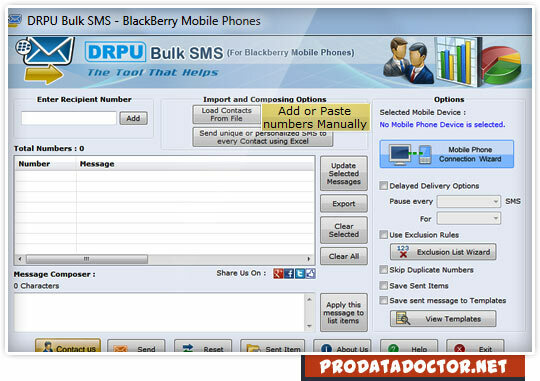 Bulk SMS software for blackberry mobile phone is useful mobile marketing program to send group text messages from your computer system using black berry mobiles. SMS gateway program provides option to prevent phone number redundancy while sending bulk SMS across the world. Telecom industry, Retail business, Training institute, School and college, Real Estate industry, Banking sectors, IT companies, MLM companies and many more. ✔ Bulk SMS software broadcast thousands of text messages over national or global mobile network without requiring any internet connection. ✔ SMS sending program successfully saves your sent text messages details which can be viewed latter whenever requires. ✔ Text message sending software support all Unicode characters for sending thousands of text messages in different languages. ✔ SMS broadcast programs provides option to import phone numbers from PC while sending group text messages using blackberry mobile phone. ✔ Cell phone texting software controls and customized load of bulk SMS over worldwide location using advance delay delivery option.